What can your children learn from a fish? Plenty — about determination, perseverance, and the weird and enthralling drama of nature. 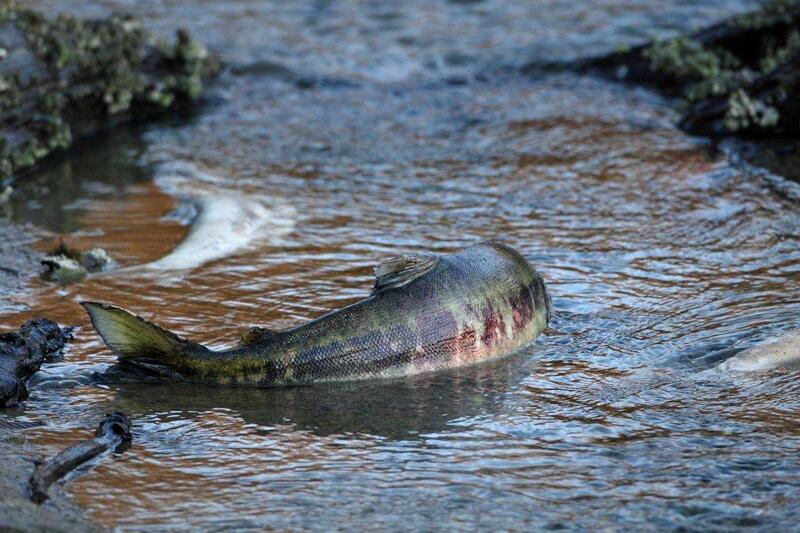 Every year, Pacific salmon travel hundreds of miles through the ocean, navigating storms and slipping past predators and fishermen’s nets, relentlessly focused on arriving at the local streams where they were hatched. Their purpose: to mate and bury their eggs in the stream bottom before they die. Where to take your kids to watch this fascinating action unfold? Spawning salmon are clearly visible from a number of local vantage points. It’s a chance for your family to get outdoors and learn about an amazing part of the region’s natural history. And don’t feel silly if you find yourself cheering on a fish — people do it all the time! Here are top locations to watch this drama unfold around the South Sound and South King County. Tip: We also have a list of 10 salmon-spotting spots around Seattle and the Eastside. These locations are ordered by when you are likely to see salmon, starting with September and October locations and continuing to November and December sites. But predicting when salmon will arrive is an inexact science. Contact locations before venturing out if possible, adjust expectations accordingly, and you will find plenty of educational opportunity in the experience. Head to three Duwamish River viewing locations, North Wind’s Weir (2914 S. 112th St., Tukwila), Tukwila Gardens Park (11269 East Marginal Way, Tukwila) and Codiga Park (12585 50th Place S., Tukwila) to see Chinook, coho and chum migrate upstream. Chinook and coho can typically be seen in August and September, and chum in October and November. Both sites are well maintained and great places to view other native wildlife as well, such as bald eagles, osprey and blue heron. Gather at Whitney Bridge Park on S.E. Green Valley Road and 212th Way S.E. to see Chinook, pink, coho and chum make their way up the Green River from September through December. The best viewing is from the 212th Street bridge. From the west parking lot, walk up to 212th, turn right and follow the broad sidewalk to the bridge for viewing. There is no need to cross this active county road. For more info, call 206-280-9551. View coho salmon during September and October from the roadway bridge on 168th Ave. S.E., just off the Auburn-Black Diamond Road. Mid-September through October is your best bet to view Chinook and coho returning to the hatchery, located at 13030 Auburn-Black Diamond Road. Check out the viewing pond and outdoor kiosk explaining hatchery operations. The hatchery is open every day from 8 a.m.–4 p.m.; staff are sometimes available to answer questions. Watch spawning Chinook in Tumwater Falls Park in late September and early October. Salmon stewards are on hand for egg-taking operations on Monday, Wednesday and Friday mornings. Salmon stewards will usually also be around to answer questions on Monday, Wednesday and Friday evenings and on weekends through Oct. 10. For info, contact Debbie Smith, City of Tumwater, at 360-754-4148. Leave the car at Puyallup’s Clarks Creek Park and follow a short trail to a footbridge overlooking spawning chum. These chum are a winter run stock with adults returning in late November to late January, but the peak of the run happens in mid-December. Visitors can tour the hatchery (12710 124th Ave. Ct. N.W., Gig Harbor) and then walk three-quarters of a mile down a gravel road to view a large run of chum and coho salmon, starting in November. For info, call 253-857-5077. This gentle nature loop offers streamside views of spawning chum salmon in November and early December, depending on rainfall. Salmon Stewards will be stationed at McLane Creek on November weekends, plus on Thanksgiving Day and the day after, from 10 a.m.–2 p.m. From Olympia, drive west on Mud Bay Road. Turn left onto Delphi Road. Turn right at the sign for the trail. You will need a Discover Pass to park . Around 40,000 chum cram into the lower two miles of this creek to spawn each fall. Best viewing is from a 1.5-mile Kennedy Creek Salmon Trail. For 2018, the trail is open to the public on weekends only, Nov. 3–30. The trail is maintained by donor support, and the first half-mile ADA-accessible. Field trips are available. From Highway 101, turn west at Old Pacific Highway. Follow the signs onto a gravel road to Kennedy Creek. Please note that Kennedy Creek has a no-dog policy to protect both the salmon and dogs; dogs are susceptible to poisoning from a parasite in the salmon. For more information, contact KennedyCreek@spsseg.org. First time out? Here are some tips to enhance your experience. Bring binoculars for a better view of the salmon’s physical changes. Dress to stay warm — watching salmon is a quiet activity. Keep pooches leashed (if dogs are allowed). A dead salmon might look like an irresistible snack. If you see a dead fish, leave it where it is. The ecosystem needs them! The salmon are hard at work. Stay out of the water and don’t disturb the fish in any way. Editor's note: ParentMap staff contributed to this article which was originally published in 2013 and updated in September 2018. Fiona Cohen lives, writes and grows tomatoes in Seattle. She has a passion for the natural history of the Pacific Coast. She has two children who still talk to her, and not just when they require transportation somewhere. She is the author of Curious Kids Nature Guide by Sasquatch Books.